641.5 is my happy place in the library (the Dewey Decimal stamp of all things cooking). You can imagine my thrill when I came across a cookbook, The Wikaninnish Cookbook (641.5971 to be exact), straight from the place my husband and I spent our honeymoon! We absolutely treated ourselves on that trip to the Wikaninnish Inn in Tofino, BC on Vancouver Island but with clarity I remember sitting in The Wikaninnish Inn restaurant warily calculating how much we could spend on one of their lavish dinners. We went once and only once but it left a lasting impression. Fast forward 20 years later and I still remember how we took our time eating that extravagantly-priced meal, savoring excessively each bite. The walk on the beach after was heavenly! Flipping through the pages of this book I ran across a salad I loved eating as a little kid–Waldorf Salad. I remember thinking those boring old lettuce leaves finally had something super exciting on top like fruit and nuts and a really creamy dressing. I must still be a kid at heart because I get kind of excited if a salad contains the addition of a few sweet toppings. 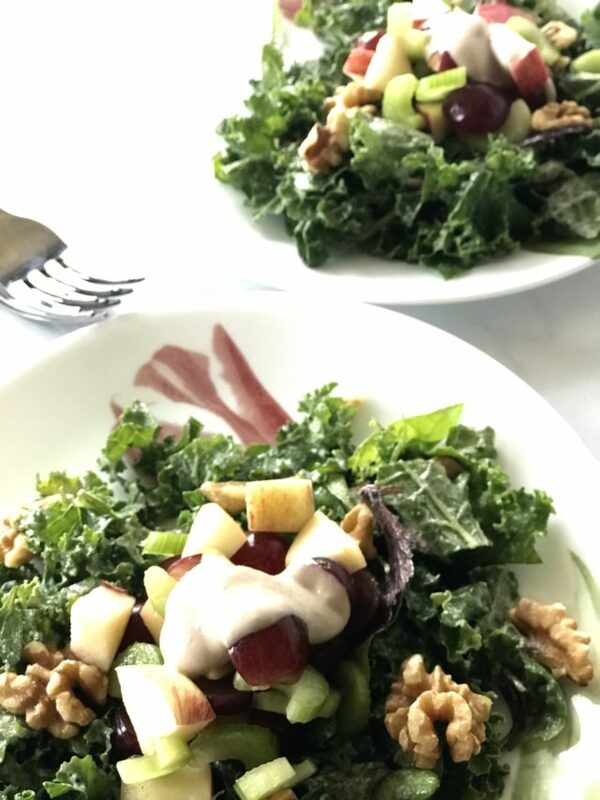 I knew right away that I needed to adapt this Westcoast Waldorf Salad recipe from the Wikaninnish to a culinary nutrition-approved one my own daughter could get excited about. And that she did! Coco, my 8 year old daughter, helps out in the kitchen as much as she can nowadays. It takes a little self-control on my part not to jump in and do things for her but I’m finding I love sitting at the breakfast bar watching her almost as much as I love cooking myself. I figure if I can get her to make anything by herself the odds are greatly in favor of her enjoying her creation. So while Coco prepared this easy recipe, I sat back, perused this newly found cookbook containing beautiful pictures of the westcoast and treated myself to some very vivid memory-making places we encountered on our honeymoon. 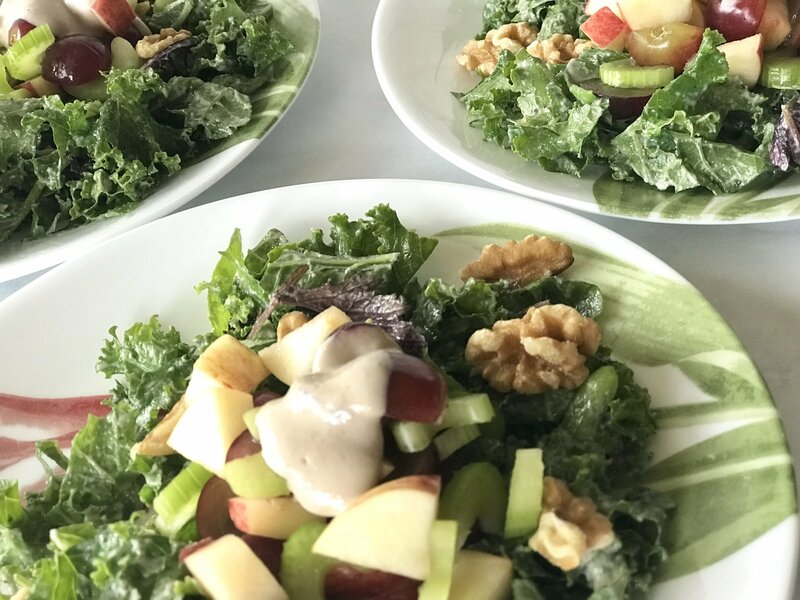 Before I get to my culinary-approved adaptation of the recipe, Waldorf Kale Salad, I wanted to share the origins of the fabulous Waldorf Salad. On March 14, 1856, Oscar Tschirky, head waiter for the Waldorf Astoria in New York, created it for a charity ball for the St. Mary’s Hospital for Children. How appropriate that a salad was created for a children’s charity that a child would actually love to eat. Celery: Celery has a natural salty taste which is a nice addition to a salad without using excessive salt. However, the body needs the right kind of salt and that is unprocessed sea salt which contains all the minerals the body needs. Table salt only contains sodium and chloride which quickly puts the body out of balance. Celery can also help to lower blood pressure (10) which normal table salt can sometimes exacerbate. Stick to celery or sea salt. What's better than topping that fresh salad with a little fruit and nuts. Somebody was thinking! The man who invented the Waldorf Salad created it for a charity ball for the St. Mary's Children's Hospital back in the 1800s. Good thinking Oscar Tschirky, head waiter of the Waldorf-Astoria in New York. A salad that both kids and adults alike enjoy. Let's switch it up and make it with kale, shall we?